This is such a happy necklace! The balance of the different elements and the blend of citrus colors is so well designed as to feel effortless. That is the hallmark of a great design, when it comes together so well. I am equally impressed that Miss Elisabeth made many of the beads in this necklace. Miss Elisabeth is like me in that a deadline is what makes her get in the studio to get the creative juices flowing. I look forward to having her join in the ABS challenges more this year! 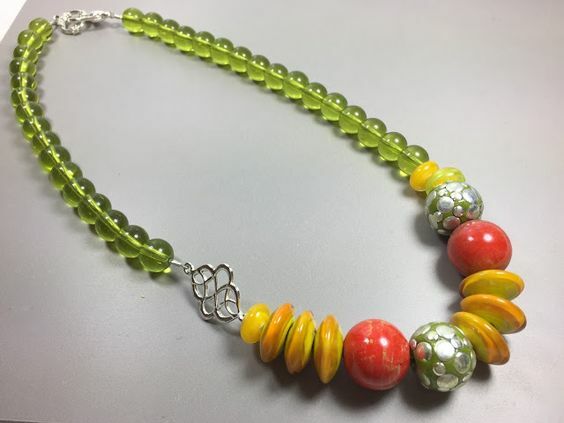 A happy necklace indeed, love the colors! Thank you!!!!!! This made my day/week/maybe month!